Which Would You Consider More Fun And A Game Changer? Which Of These Would You Consider The Better Tank? Ok so I noticed I already have an excellent crew for my marathon tank SU 130 PM. This means I now have an pretty good BIA crew with skill I can use to resurrect one of my tanks from the keeper corner of my garage which I would have once liked but moved crew to their tier 10 counterparts once the time came or stuck them somewhere else. I use to really like the T-10 when I played it but that was a long while ago so don't know how it fairs now. I also enjoyed the Obj 430 but what annoyed me about that tank was that it caught fire a hell of a lot and it was somewhat snooker whenever it got a map or situation in which it had to fight big armored tanks with no relocation options at hand since unlike the T-10, the Obj 430 only has a pretty sad 270 pen which simply won't get the job done against many big armored tanks frontally nor has it the gun accuracy to reliably pick off a cupola plus APCR is really bouncy so anything other than the exact middle of a cupola or a nice flat bit of armor and it tends to ping off. The T-10 however comes pen almost as good as that but as standard ammo and when confronted with big armored hulks, it can burn some HEAT very effectively through those tanks with 340 pen. That means the T-10 always has a punch it can throw and is always a factor in every single battle it fights in. But what about the fun factor? I can't remember which is more fun, maybe you guys can. Being a medium or heavy is not a deciding factor here it's purely about the fun and I'd find both very similar in that regards so it's not a case of "do you prefer mediums or heavies" as these tanks not really a typical medium nor a typical heavy and similar in many ways. Also, I already have these tanks so I'm not short of any, it's just I have a crew to spare and want to get one of these 2 back on the road. Edited by TungstenHitman, 20 January 2019 - 11:24 AM. While the T-10 is very effective and good fun, it's armour is highly suspect, which for a tier IX heavy means you need to think quite hard about where you put it and how you angle it. The T-10 speed is also good so there is a real balance to be decided on each match between the team line ups and the map whether to grab an advanced position. Over extending in the T-10 and coming to grief can be an issue. 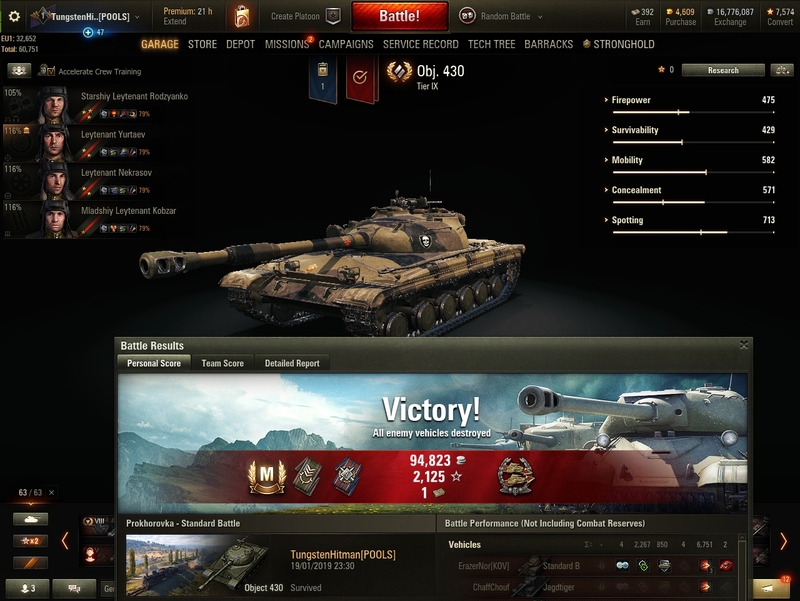 The object 430 has idiot proof armour and is a bit slow for a medium. Resulting in gameplay where you will not make early mistakes or lose hp early. It has alot of endgame carry potential. 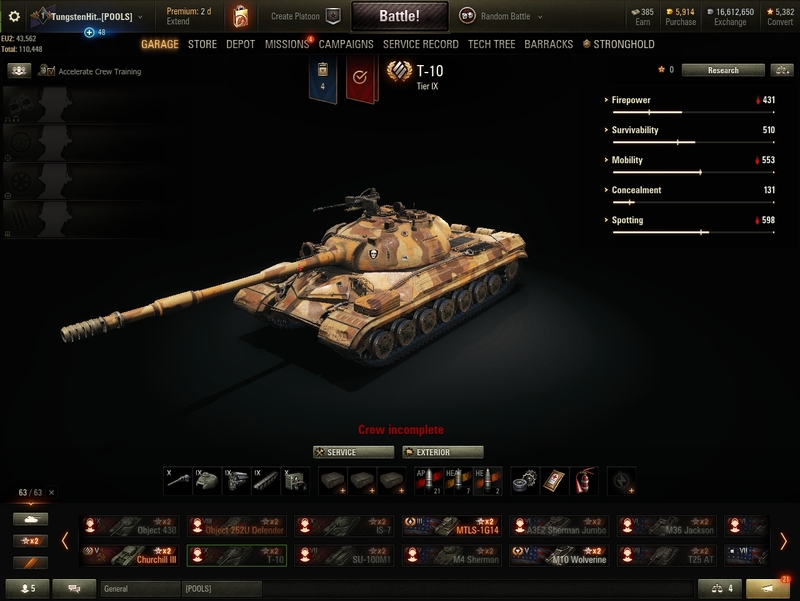 I have sold the the T-10 having researched the IS7 and the 277. 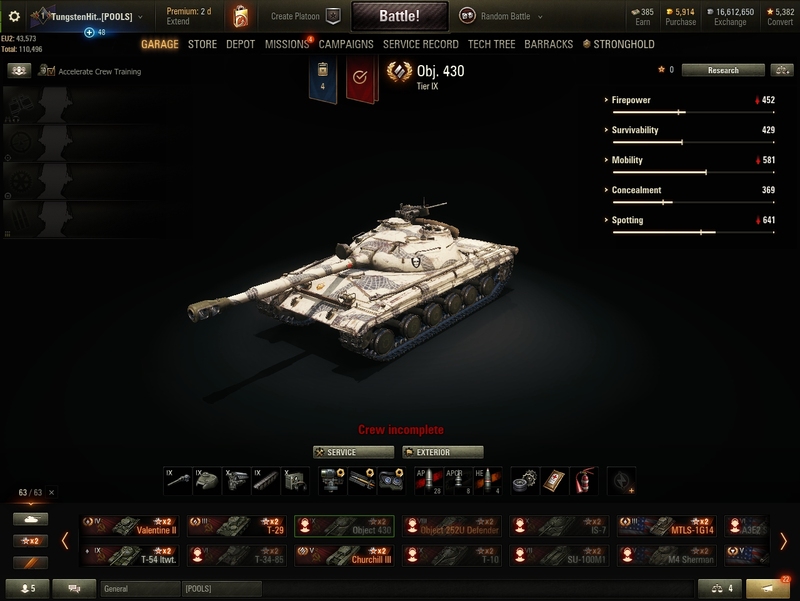 Although I have bought the Object 430U I have kept the Object 430 for platooning at tier IX. I cry every time I see females wasted as loaders, drivers or radio-operators. One of them leads to the most OP TX med and other one leads to a good heavy tank. I think the choice is pretty clear. Edited by DeadLecter, 19 January 2019 - 08:44 PM. Wow, that's a landslide in favor of the Obj 430. Never to take your input lightly I put the crew in that tank. 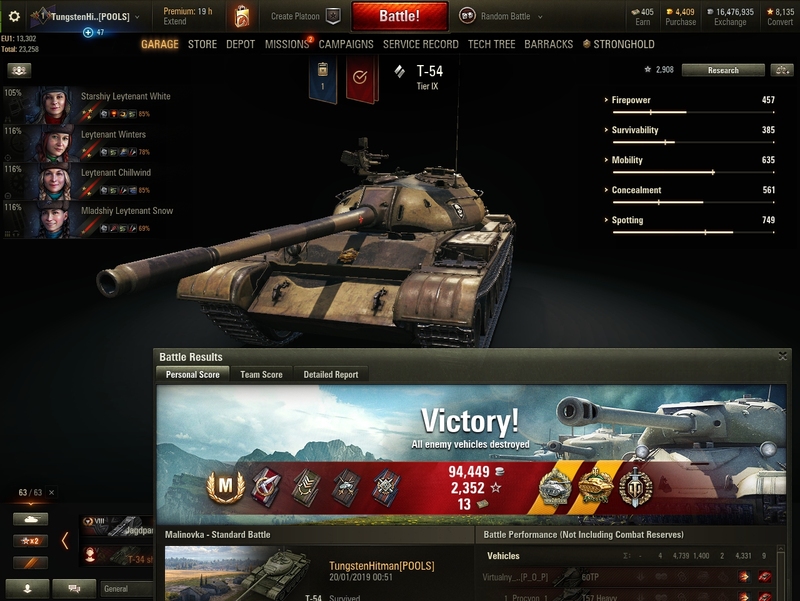 It was one of those tanks that regardless of 9 kill battles and such, to my amazement I hadn't actually aced it yet. So I immediately rectified that with a 9k combined which was still tricky since it was a top tier battle for me. Animal of a tank it really is. Crude, unrefined and very Russian. I also unlocked the second gun for the T-54 option, the DPM HEAT spamming gun. It's ok, had to work my arse off for the win with a big carry with it. I didn't make 50k I made 2k, I guess that's the difference but I like the playstyle choice anyway. RASHA! I love tier 9 MTs...but I really, really don´t like the 430. So for that reason alone I would go with the T-10. What are your favorite t9 mt then ? Ya they're great fun and I'm going to start using them and enjoying them a lot more from now on. I was doing to much grinding instead of just enjoying the great tanks I have. Don't know why I do that, stupid really. O guys, another question and poll. Since it's cheap crew transfer weekend, maybe I should transfer crew from the Obj. 257 to the T-10? What would you consider to be the better of these two heaviums? I've only had a small few battles with the Obj. 257 so have not yet really built up an opinion or understanding of this tank yet. Obj 430 more versatile than T-10 despite the gun of the T-10 is very good. If that's the case I'd probably wait until the next crew discount and put in some more time with the 257 so you can make a more informed decision on which you find works best for you and you want to keep. 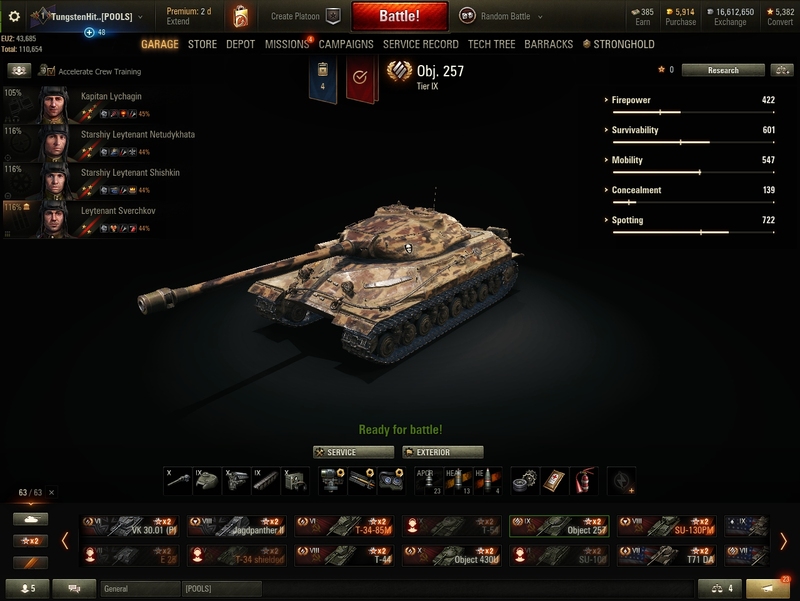 Give a chance to obj257, you have to keep in Mind your side armour is stronger than front hull armour. This tank is oversidescraping god. You also can trust on your turret and It is russian so gun is hiting every snapshot. Try to make another crew with sixth sense , repairs, bia for T-10. You have x3 crew this weekend + crew boosters. Why to choose between diferent decent russian tanks, if you can enjoy all of them. Gun parameters are meh and armour works only against noobs. T-10 has a far better gun, with excellent penetration and stabilization parameters. I would suggest to go for the T-10. Effective against 80%+ of the player base then. Edited by Dava_117, 20 January 2019 - 02:43 PM.